Unfinished ships in 10 business days. Painted or stained - 15 business days. Let the New Haven Custom Wood Cornice add just the right finishing touch to any window or door in your home. With its clean and simple crown molding and unadorned bottom skirt it will fit perfectly into any design scheme. For an elegant yet inexpensive cornice, the New Haven has a timeless style that is similar to more expensive designs. Simply provide the opening dimensions to accommodate the window treatment, blinds, or other hardware to be covered with the valance. Installation hardware and instructions are included. 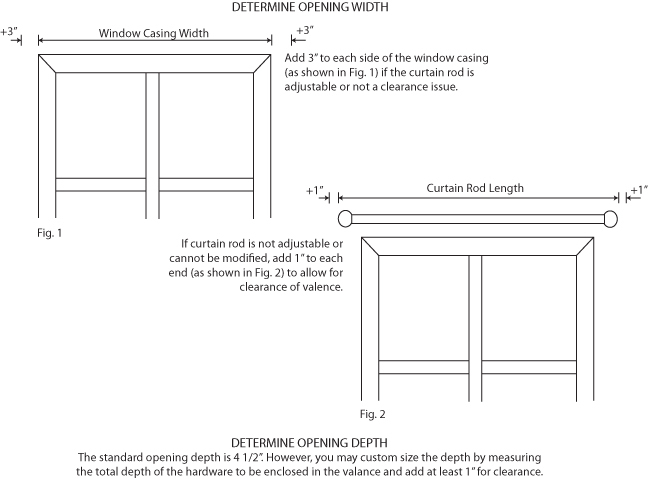 See diagram below for suggested methods to determine opening sizes. Standard Opening Depth is 4 1/2" but can be customized. Overall Width at Top = Opening Width plus 7 1/2"
Overall Height = 5 1/2"
Depth at Top = Opening Depth plus 3 3/4"
Click the button below to add the New Haven Wood Cornice to your wish list.